How many lumens per square foot do I need? If you resent the idea of lighting calculations and aren't sure where to start, we've got you covered. 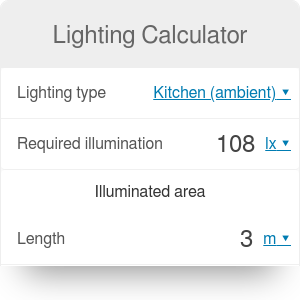 This foot candle calculator gives you the optimal level of illumination for each room in your home and determines how many light fixtures you need to achieve it. Additionally, we will provide you with foolproof lighting calculation formulas that make the whole planning process a breeze! In the first step of your calculations, you need to choose the type of area and activity that you want to illuminate. Simply select one of the options from the list, and our lighting calculator will automatically determine the optimal level of illumination in lux or foot candles (that is, how much light should be incident on the surface). Intuitively, ambient light in the bedroom shouldn't affect our preparations to sleep time and won't be as intensive as the light required for sewing. The next thing you need to determine is the illuminated area. In the case of a bedroom or a bathroom, it will simply be the total area of the room. If you're trying to figure out LED lighting for your kitchen counter, the illuminated area will be calculated as the length of the counter multiplied by its width. You can use illumination units of lux or foot candles. If you want to recalculate between these units, remember that one foot-candle equals 10.764 lux. BL stands for the number of lumens that a light bulb emits. You can usually find this number on the bulb packaging. It's a much better indicator of the bulb's luminosity than the wattage, as LED lights often need less power than regular light bulbs. Choose the area of the house that you want to illuminate. Let's say you're planning the lighting for your kitchen, including the kitchen counter. Check the optimal lighting level. For the whole kitchen, it is 108 lux, and for the counter (detailed tasks) - 538 lux. Then, choose the type of a light bulb you want to use. Let's assume you're using a standard bulb that emits 800 lumens for the kitchen and small LED lights that emit 200 lumens each above the counter. You will need two light bulbs (800 lumens each) to illuminate the whole kitchen and additional 7 LED lights (200 lumens each) above the counter. If you're wondering how much you'll pay for electricity when using all of this lighting, take a look at the electricity cost calculator! Lighting Calculator can be embedded on your website to enrich the content you wrote and make it easier for your visitors to understand your message.